Wat Phra Si Rattana Satsadaram or Wat Phra Kaew was build under the royal order of King Rama the First. It was builded according to Wat Phra Sri Sanphet, a temple located in Ayutthaya, when established Rattakosin in 1782 and finish in 1784.The temple sits on the east side and in the outter royal court. Inside sits the Emeral Buddha made in single emera, 48.0 cm wide 66 cm tall and rest on a golden throne. Around the temple on the outside, there are wall paintings telling a story of Ramayana. Other place of intersts include Phra Prang, Phra Sri Rattana Pagoda, a mock of Prasat Nakhonwat, Prasat Phrathepbidorn, etc. Wat Phra Si Rattana Satsadaram receive renovation every 50 years the renovation started during the reign of King rama the third, king rkma the fifth, king rama the seventh and king rama nineth to commenmorate. During king Rama the Nineth was to commenmorate the 200 aniversary of Rattanakosin in year 1982. A historic temple in Bangkok, Wat Bowon Niwet Wiharn was established in 1829 and is located in the Bang Lamphu neighborhood, close to Khaosan Road tourist area. 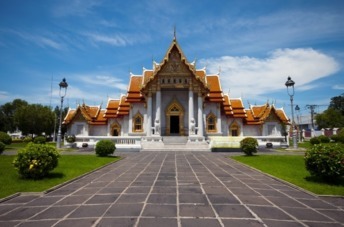 Its main ordination hall is home to the revered Phra Phutthachinnasi, an ancient Buddha image believed to be built in circa 1357. Wat Bowon Niwet Wiharn was the residence of King Rama IV during his monkhood years before accession to the throne. King Rama VII and Rama IX also resided here during their monkhood. Wat Benchamabophit (the Marble Temple) was designed by Prince Narisara Nuwattiwong. 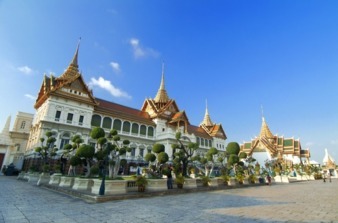 It typifies the impressive and orderly traditional Thai architecture. It is thus accepted as having the best architectural plan. The temple was built from marbles imported from Italy, and that is the reason why the temple is commonly known among foreign tourists as the Marble Temple. Significant Architectures within the Temple Phra Phuttha Chinnarat is a bronze replica of the original statue of the Sukhothai Period (1238-1438) which is still enshrined in Wat Phrasi Rattana Mahathat in Phitsanulok Province. The chapel is entirely decorated with marbles. The chapel is in the shape of five-layered square. The roof is in yellow and is curved. 52 Buddha statues in different postures placed on the balcony at the back of the chapel. It is Prince Damrong Rajanubhab who collected these statues taken from cities he visited as well as overseas. The Som Dej Pavilion has four faces, with breathtaking decorations and elaborate patterns. The Ordination Throne Hall is an abode for King Rama V when he was ordained in 2416 B.E. The Song Tham Thorne Hall was built by Queen Saovabha Phongsri in dedication to Royal Crown Prince Vajirunhis Sor Por Chapel was built by Queen Saovabha Phongsri as a library collecting Buddhist scriptures. 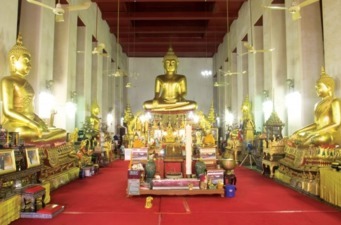 Nowadays, it is where Norasingha Buddhists statue and other significant statues are housed. Wat Pho is not only one of the most visited Buddhist temples in Bangkok but it is where history, medical science and educational institute combined. 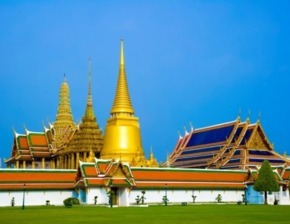 Officially named Wat Prachetuphon Vimon Mangkararam, Wat Pho was believed to be founded during the 16th century and was later served as The Royal Temple of King Rama I of Chakri Dynasty. Laid inside the main ordination hall is the sacred 46-meter Reclining Buddha whose feet are beautifully inlaid with mother-of-pearl, carved with holy signs. 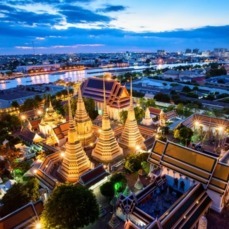 Wat Pho is, among Thais, also known as “the nation’s first public university,” thanks to 1,360 marble inscriptions about medical, historical and liberal sciences places all around the temple where the people can read and learn anytime. Marble inscriptions about medical sciences, anatomy and orthopedics are the origins of Wat Pho Thai traditional massage principles, which has made Wat Pho a world’s famous site. The traditional service, nowadays, is also available at the nearby pavilion. in 2008, Wat Pho was listed UNESCO’s Memory of the World (MOW) as a documentary heritage for Asia and Pacific Region. Our website chatuchakmarket.org is the new information hub for the biggest weekend market in the World, Chatuchak Market. With over 200,000 visitors each week, Chatuchak Market has grown into a highly successful market with great products for sale. 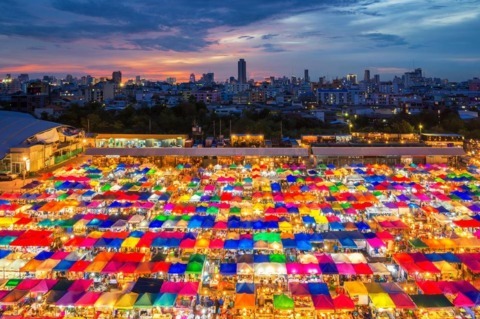 With thousands of items to choose from over 25 acres of shopping, tourists will be delirious with the volume of shopping Chatuchak Market has in store for them. Chatuchakmarket.org is the primary destination on the Internet get all the latest news on the market. Not only this but it has a Tips and FAQs page, gallery (For visitors to share their photos), a Visitors Guide and a How to get there section that are all easily accessible to the general public. This website is unrivalled by other websites on the market and we search the market for the best deals that will interest all shoppers. 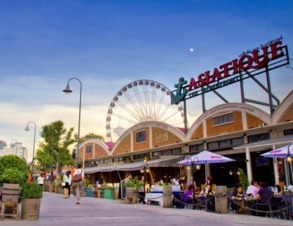 Asiatique The Riverfront is the largest shopping center on the Chao Phraya River. The port on behalf of East Asiatic Company were converted to a traditional colonial style structure in the reign of King Rama V.
Muay Thai Live Stage show + Muay Thai Fight. Muay Thai Live: The Legend Lives is an epic live-show that chronicles 300 years of Thai boxing history through a stellar combination of fights, stunts, drama, music, and electrifying light and sound effects. This award-winning production is created and directed by Ekachai Uekrongtham, the critically-acclaimed director of the film Skin Trade (2014), starring Thai action star Tony Jaa, as well as Beautiful Boxer (2013) and the hit Singaporean musical theatre production Chang & Eng (2003). Duration: 45 minutes Muay Thai Live: Boxing – Warriors Rising are real live fights under the mentorship of Muay Thai Grand Master Sane Tubtimtong. Duration: 30 minutes Languages: English/Thai with English, Chinese, and Japanese subtitles. Show Time: 8pm from Tuesday – Sunday (except Mondays) Duration: 1.30 hrs (Total time including the 15 min break) Suitable for all audiences Venue The Stage is a brand new, world-class theatre built for the show at Asiatique the Riverfront, Asia’s largest riverside outdoor lifestyle, dining experience, and al-fresco shopping complex. The Stage is also a multi-purpose venue that is ideal for conferences, seminars, and events. Capacity: 600 seats (includes 269 premium seats and 331 standard seats). Facilities/Services: Concession stands serving drinks and snacks, souvenir shop, autograph-signing session and photo-op with the casts. The project of the same developer of the bygone Suanlum Night Bazaar, Siam Paradise Night Bazaar aims to be a night-time one stop shopping destination where you find everything from fashion items and spas to furniture and pet utilities. 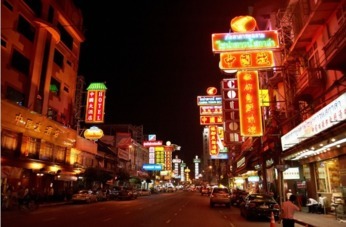 Bangkok’s Chinatown, Thailand’s largest Chinese community, is commonly known among Thais as Yaowarat, according to the name of the road where it is located. The Chinese community dominated trades between Siam (ancient Thailand) and China since the reign of King Rama I, centered around Ratchawong Pier, while the construction of Yaowarat Road hadn’t begun until 1891 during the reign of King Rama V. Today, Yaowarat is widely known as the kingdom’s largest center of gold trade and a great foodie destination. Yaowarat simply has two faces: If you visit Yaowarat during the day, what you see along both sides of this one and a half kilometer road are shops selling gold, Chinese herbs, fruits and Chinese restaurants serving authentic cuisine. But if you visit Yaowarat after sunset, the road turns into a street food heaven where a number of food trucks prepare you marvelous food, from Chinese fried noodles to iced Chinese dessert. Jim Thompson House is located in soi Kasemsan soi 2, Rama I road, opposite to the National Stadium. It is the Thai house of James H. W. Thompson, the American soldier who initiated Thai silk industry in Thailand. He was granted the Most Exalted Order of the White Elephant from the royal which is the only exalted order granted to foreigners who made Thailand benefit. 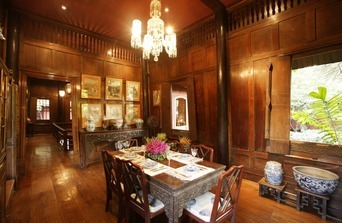 Jim Thompson House is a Thai teakwood house which he bought from the former owner of the house. The parts of each house were delivered to the recent area. The Thai house was completely built in 1959. Since Jim Thompson loved collecting antiques, the house, which he stayed between 1947 – 1967, also displays his collection under Jim Thompson foundation. In front of Jim Thompson House is Jim Thompson Restaurant and wine Bar which is used to welcome guests and visitors. Inside, the room is decorated in Thai style with Thai furniture, ornamental plants and flowers including Jim Thompson’s collections. They are mainly painted potteries such as Chinese painted potteries since Song dynasty to the ones in B.E. 19. Most of them are Chinaware which were exported in Ming dynasty while some items are from Ayutthaya, which were exported to China in B.E. 15-17, Lopburi – Khmer painted potteries in Lopburi kingdom in B.E. 12, Sukhothai and Sawankalok painted potteries which were made between B.E. 18 -19, the bodies of the Buddha images in Dvarati period and giant “Phra Pheang” made from baked clay and colored mirror and consisted of 450 small Buddha images. 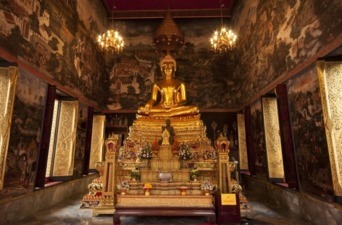 Apart from theses, there are a large number of ancient paintings mainly describing about Buddhism including Phra Bot, the cloth with the picture of the Buddha, made in Rattanakosin period around B.E. 18 – 19. Visiting here, you will have a great chance to study Thai history from the past only from observing these priceless Jim Thompson’s collections. Visit www.jimthompson.com or www.jimthompsonhouse.com for more information. Museum Siam: Discovery Museum is located in ThanonSanam Chai, The Grand Palace, substituting the former building of Ministry of Commerce. The building is awarded an outstanding award of art and architecture preservation in 2006 from the committee on art and architecture preservation of the Association of Siamese Architects under the Royal Patronage of His Majesty the King (ASA). The museum serves as a learning center on ethnology, anthropology, and other fields related to Thai society and Southeast Asia, in order to instill consciousness and understanding of the Thai people in their history, nation, culture, and localities, as well as connect relative ties with neighboring countries.New methods of a display with modern media have been applied to enable participation of visitors in learning and understanding historical stories of the Thai nation. The contents on display in the form of the ‘Essays on Thailand’ have been divided into 14 rooms in the three-storey building. In addition, learning activities are organized for youth and aficionados of museums. Museum Siam: Discovery Center is open for the public and tourists from Tuesdays to Sundays (10.00 a.m.-6 p.m.) and is closed on Mondays. Admission fee is at 50 baht for students, 100 baht for Thai adults and 200 baht for foreigners. 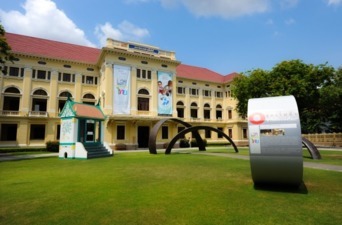 For more information www.museumsiam.com.